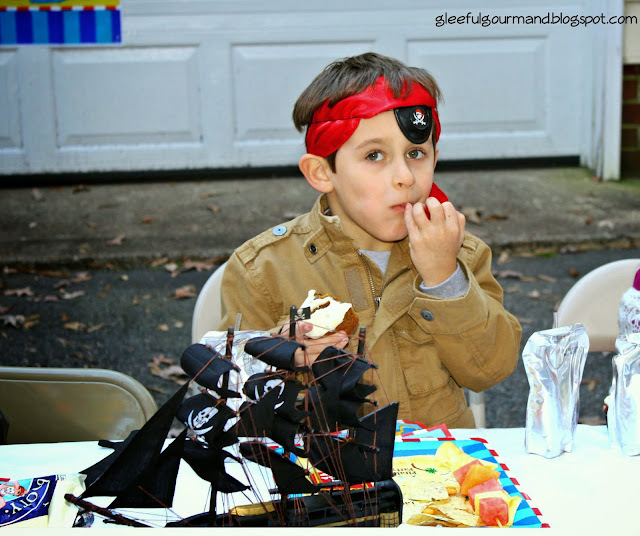 The Gleeful Gourmand: Birthday Pirate Party! I hope you'll forgive me for being absent the last couple of weeks. We've been dealing with a lot of stuff here over at The Gleeful Gourmand household. The best of what's kept me occupied lately is that our son turned 6 this past weekend! We knew we wanted to have a smallish party at home to save on expense, so I started thinking about themes. 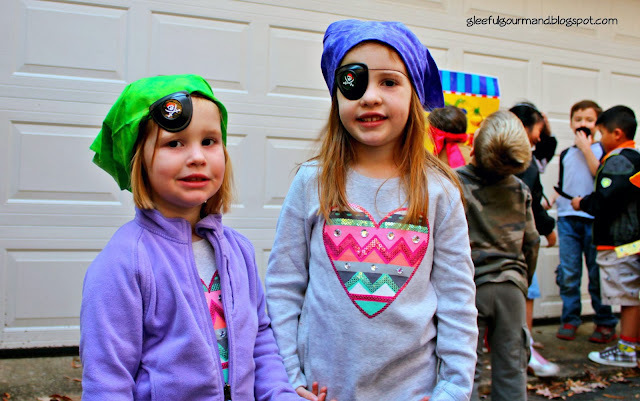 Our kids are completely obsessed with the Disney show "Jake and the Neverland Pirates" so it seemed that a pirate theme was inevitable. Once I pitched it to my son, and he agreed (with a hearty "arrggh!" no less), I did what any self-respecting Pinterest user would do: scoured the web and other people's blogs to see what they did. Boy, did I find a lot! From the ultra-lavish (complete with real pirate sails billowing at each table), to the super simple, I culled the best of what I found, and then modified it to fit our party needs. 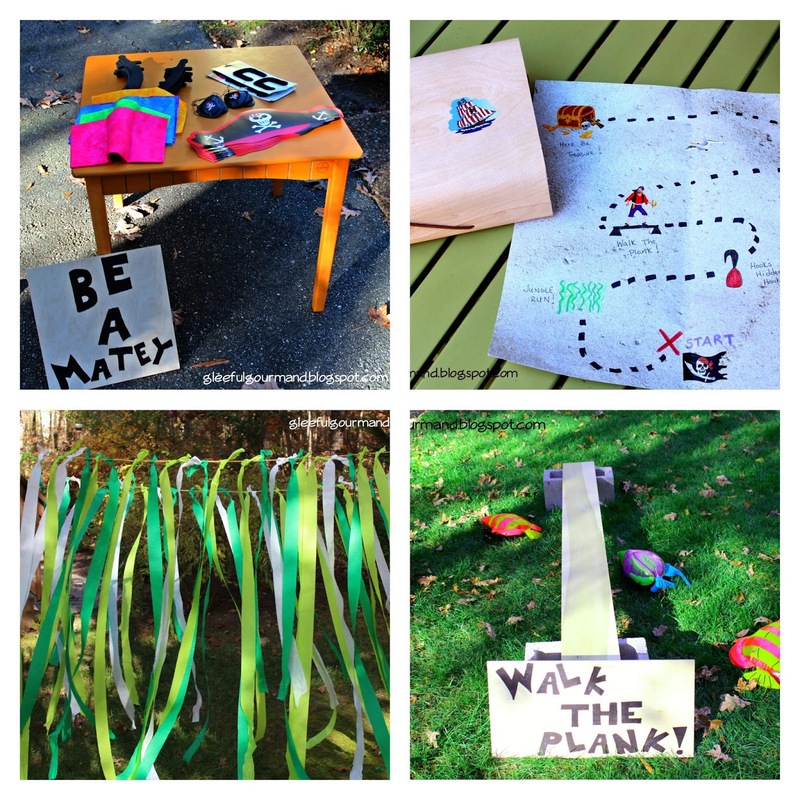 Because I felt really grateful that something like Pinterest exists at all, and that I could see all the wonderful ideas people had come up with, I've decided to share what I did - hopefully anyone looking for ideas to steal for their pirate party will be inspired! However, even if you don't give a fig about pirate parties, I hope you'll stay to the end of the post to get the recipe for the cupcakes I made: Pumpkin Chocolate Chip. Oh my! Decorations, courtesy of a friend who held a mermaid party this summer. Fish net, starfish, and my son's pirate sword. 1. Walk The Plank: We got two cinder blocks and a long, sturdy plank of wood from Home Depot. From Hobby Lobby I bought two pieces of wood and ginormous Sharpie markers to make signs, and three super cheap inflatable fish to put beneath the plank. If this party had been in the summer, I totally would have had a baby pool filled with water to make it more fun. As it was, the kids had a blast running across the plank. 3. Pin the Treasure on the Map: (Party City) This was the next game they played, taped our garage door. It took up a good chunk of time, which was great while I was setting up the food and cupcakes. A) "Jungle Run" - we strung rope between our deck and some leland trees, and then tied green and white crepe paper to it. I made the kids run through twice - just to run off energy. B) "Hook's Hidden Hook" - with a hook hand I found at Hobby Lobby, hidden in some bushes. C) "Secret Spy Glass" - a pirate spy glass I found at Party City in their Halloween section, hidden by a tree. D) "Rock Hop" - around 10 gray card stock cut in circles and laid out - they had to hop on each rock. "Be A Matey," "Treasure Map Challenge," "Jungle Run," and "Walk the Plank." The goodie bags were also from Hobby Lobby, paper boxes that folded into treasure chests. In each was one sheet of pirate tattoos, a small container of bubbles, and from Sweet Spot, a baggie with a giant gummy shark, and three gummy whales. 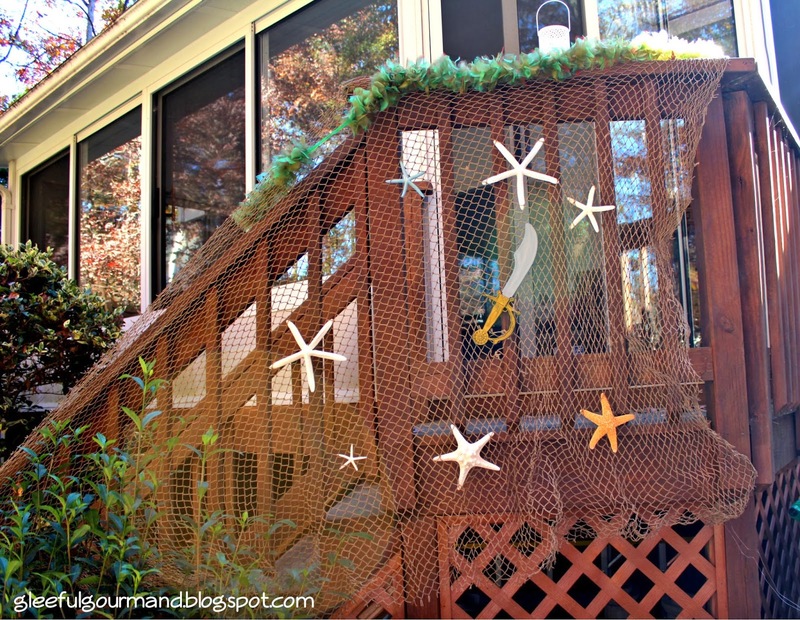 5) Decorations: I borrowed some decorations from a friend who threw a mermaid party this summer: Fish netting, different colored and sized starfish, a green boa that looked like seaweed, and my son's pirate sword (with his permission) stuck in the middle. For the tables, I used pirate-themed packs from Party City, but for the table the kids sat at, I actually found a great model pirate ship at Hobby Lobby for just $10! I sprinkled doubloons all around it. 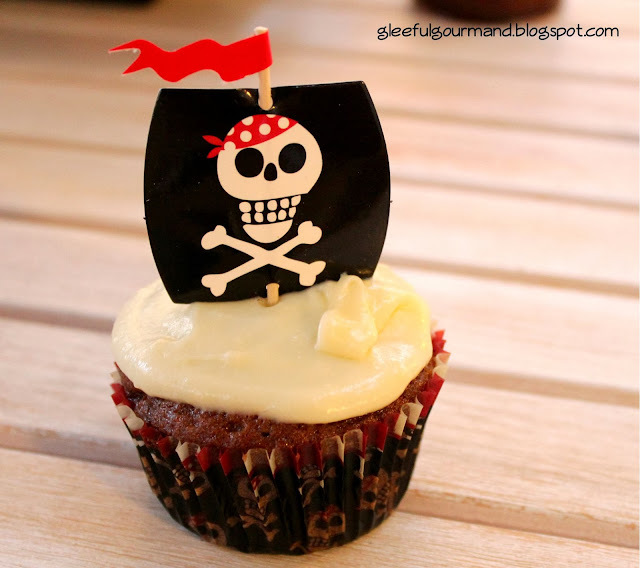 6) Food: I kept it super simple: Pirate's Booty, "Fish and Chips" (Goldfish and Tortilla Chips), Fruit Kebabs, Juice and Pumpkin Chocolate Chip Cupcakes - the one thing our son demanded for his birthday party! This recipe comes from Kirsten Oliphant, and as my husband declared, they are "stupid good." Rich and decadent, yet moist and somehow light all at the same time, you can make a full two-layer cake, or 28 cupcakes from her recipe. You can read her full post here. Sinfully delicious, all I can say is, you've got to get in on this action! Preheat oven to 350 degrees. Grease two 9-inch cake pans or prepare baking cups for cupcakes. Mix the pumpkin, oil, eggs, sugar, and vanilla. Beat until well combined. In a separate bowl, mix dry ingredients. Add to the wet ingredients in three increments, beat until well incorporated. Stir in chocolate chips. Bake for 20-30 minutes until toothpick or cake tester comes out clean. Cupcakes take about 20 minutes and make 28 (using 1/4 cup batter/baking cup). Two round cakes take about 30 minutes. While the cake is baking, cream the butter and cream cheese. Add the vanilla and confectioners sugar, beating until mixed well and smooth. Use milk as needed to give a consistency that is firm enough to stay in place. The Birthday Boy, too consumed with his cupcake to smile. Or act like a pirate. 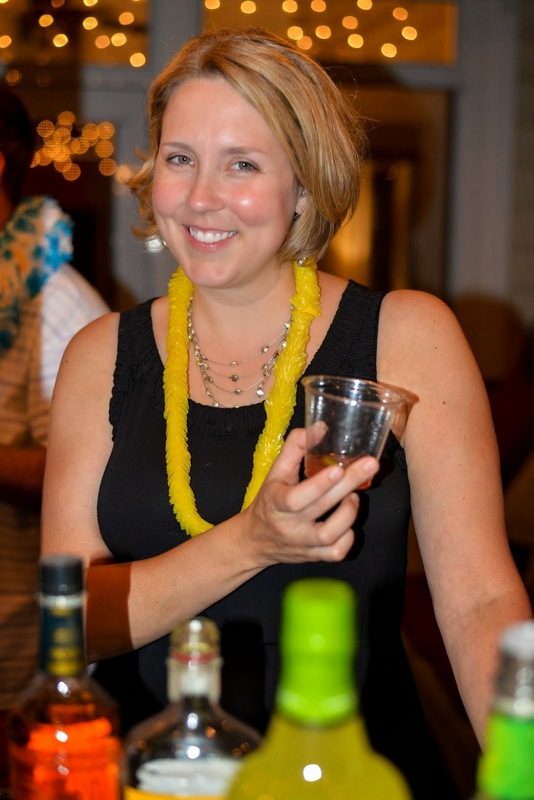 Looks like everyone had a blast and things were manageable for you.... Win:win! Congrats on coming up with so many great ideas and plans for all. Happy Birthday to Liam! Thanks, Ali! You know what? I had so much fun planning it. And like I said, thank goodness for Pinterest. Not only did it make it easier to plan, but it really sparked my creativity!